About 10% percent of the population of this world is left-handed. Left-handed people are considered to be the odd one out. It’s good to be the odd one. Being a left-handed can surely be the more interesting than being an ordinary right-handed. But the problem arises when you get to see that almost every gadgets, tools and merchandise are made is such a way that it feels most comfortable in a right hand. Although almost everything can be used comfortably by a left-handed, things which are specialized to fit properly into the hand can create a bit problem. Because most of them are prone to fit perfect on a right hand. It can be a very problematic situation for left-handed. One such tool is a scissor. You can find out that most scissors are made especially for right hands; using them as a left-handed for a long time can make the hands sore. To beat that the problem there are many best left-handed scissors are available. What Is a Left-Handed Scissor? A left-handed scissor is specially designed for left-handed people. Its appearances are similar to any other ordinary scissors. Except for that the direction of the blades on left-handed scissors is reversed, where the top blade will be facing left. This left-handed scissor makes cutting easier for a left-handed. As in most cases while cutting a paper a lefty will probably not get to see the lines drawn on the paper. Or even if they manage to see the lines the paper would bend more than being cut. So, for a cutting experience with ease, a left-handed scissors is a must for a lefty. Before you start your hunt for your best left-handed scissors you should remember or take notes of some points for a better buying experience. The direction of the blade is very important to notice before you attempt to buy the best scissor that cooperates with your left hand. A left-handed scissor should exactly look like a mirror image of a right-hand scissors. An important thing to take into accounting is that not every left-handed scissor is offered with this facility. You may find left-handed scissors in which only the handles are left-handed and not the blades. You might think that a left-handed handle is all you need to be able to cut properly. But if the blades are not left-handed then you won’t be able to cut things with ease. You will have problems doing the task. A true left-handed scissor will always look like a reversed right-handed scissors. A left-handed scissor is also available in various shapes and sizes. Before you buy always have a clear estimation that it meets your requirements. There are scissors specialized for crafting, sewing and fabrics individually. A crafting scissor is more suitable for cutting papers, plastic bags, and strings etc. ; if you attempt to cut a fabric with it then it wouldn’t cut the fabrics properly and would lose its sharpness. And a sewing scissor will cut fabrics effectively but will get dull if you cut papers with it very often. So choose wisely before you buy the perfect left-handed scissor for you. All scissors are very easy to use, but it gets critical in case of a left-handed scissor if the design is not perfect. If the design is perfect which is the mirror image of a right-handed syrup then no doubt that it is perfect and easy to use for a lefty. If the scissors are specialized in specific takes then it’s more likely that they will be in a perfect size which is appropriate for their tasks. But if it is an all-purpose scissor than you may need to choose an individual for different tasks. Choose a small scissor for crafting, along with scissor for seeing and dressmaking and a medium for DIY projects with fabrics. Always choose a scissor which is very lightweight. It will let you work with ease. A heavy scissor will possibly create sore hands, finger fatigue, and muscle pains. For a comfortable working experience buy a scissor which is lightweight but effective. The blades should be made of high-quality metals for better durability. An appropriate metal for the blades can be a stainless steel. Stainless steel is known for being rust proof and corrosion resistant. A scissor blade made of better quality materials will also keep the blades sharp for long. Make sure the handles are made of soft or comfortable materials like soft plastic or rubber. It will prevent finger fatigue and make you feel comfortable in long hours of work. This scissor is specialized with ergonomic handles that increase the control and sensitivity of the scissors. It can cut all the way up to the tip. It is very sharp and has precision ground blades which make it stay sharp for longer. The bent design of the handle keeps the materials flat for a better experience. 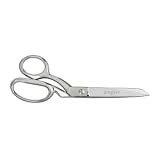 The scissors are very lightweight and fit comfortably in the hand. It is ideal for cutting silk, multiple layers of fabrics and even denim. The blades are made of stainless steel so it won’t rust easily. Has lifetime guarantee. They don’t stay sharp for long as they promise to. But it cuts quite good when sharpened. It doesn’t let the hands to sore. Fits very comfortably in the hand. Relative two positions of the handle are bad. More energy is required to open the scissors. The handles are made of hard plastic with edges which makes the grip uncomfortable. The scissors are durable and well made. This scissor is specially made for left-handed children. The handles give a very soft and comfortable grip. Has pointed edges that give a clear and even cut. It is very safe for kids. Has “splash” design which makes cutting a fun thing for kids with this scissor. It has high-quality blades that give good cutting experience with safety. The material with which the blades are made is very good. The handles are made of rubber instead of hard plastic, gives excellent grip. These are ideal for longer length cuts. The edges are strong enough to cut multiple layers of fabric very effectively. The edges cut flawlessly all the way through the points. The bent created in the handle makes it comfortable to cut across a tabletop or a counter. It is an ideal scissor for left-handed people. It can effectively cut patterns, seams, and swaths. The blades are double plated; which is chrome-over-nickel polished. Very comfortable to handle. The scissors are long-lasting and stay sharp for long period of time. The scissors are a bit than usual. The thumb hole of the handles is larger, which makes the grip little uncomfortable. Cuts thick fabrics effectively. The scissors are very durable. This scissor is more for fabrics than for crafting. The blades are made of stainless steel. Won’t rust. The pivot of the blades can be adjustable. The blades are ground honed and polished for better sharpness and cutting experience. The handles are made of polypropylene, making the grip very comfortable and non-slippery. It is ideal for a different range of cutting experience. Has lifetime guarantee. The scissors are sturdy and very strong. The design is made accurately and durable also. It can easily cut through 16 layers of ordinary paper without any problems. The sharpness of this sears is excellent. You will hardly need to sharpen this. This scissor is children-friendly, has ergonomic handles that reduce chances of hand fatigue and sore hands. The handles are designed in such a way it increases the power exerted on it and cuts evenly. Featured with an antimicrobial technique that prevents the growth of microorganisms on the handles. Hence it’s a safe and fun product for kids. It is perfectly suitable for classroom projects, cuts paper evenly and smoothly, but also adaptable to fabrics and strings. The blades are made of high-quality stainless steel that keeps the blades corrosion resistant and rust proof. It is made very strong and durable. Has a 5 years warranty. It sticks very often when the handles are closed together. It can break off into two parts after few times of usage. The packet on the advertisement shows a set of 4 scissors which is a bit confusing because only home scissor is delivered. Ideal for any cutting tasks held at home. Works really great for fabrics, plastic bags, thin and soft materials and packaging materials. Handles are made of soft handles which gives a very comfortable grip. Has 18 months worry-free warranty with 30 days satisfaction guarantee. The edges are very sharp and precise. It is usable for almost everything soft. Can nicely cut crisps. Cuts very well almost everything. High-quality scissor with greater durability. This duckbill scissor is made of an add ½ inches wider than usual. This scissor is made for learning applique for lefties. The blades are forged with German stainless steel. It is very strong and rust proof. The blades are 6inch long with ½ inch wide for better smoothness whole cutting the edges. This scissor is perfect for trimming stabilizer under the embroidery and the seams. The scissors are sharp, not sharp enough, it loses its sharpness after few usages. The quality of the scissor is not that good. Otherwise, it’s an okay product for a lefty. 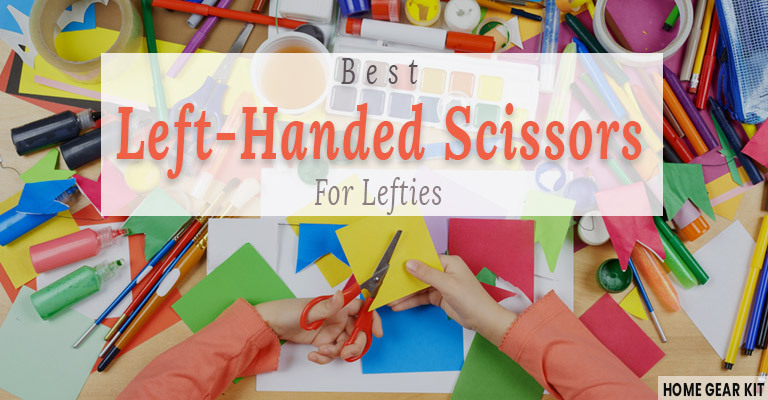 It might seem frustrating for a lefty but it’s true that finding a left-handed scissor can be very rare and a challenging thing. You will mostly need to order them online because a local store would rarely have them on a regular basis. So practicing your cutting skills with right-handed scissors can save you from an emergency or an unfortunate day. Before you start your practice keep in mind that the handles would make you feel awkward no matter how comfortable the grip is. This is because the handle of the design is made for right hands. You will obviously need to exert your power carefully and find out at what angle it works best for you. You need to work this out because again it is designed for right-handed people, and our right hand and left-hand acts differently. A lefty’s nature is to cut clockwise. But attempting to cut a paper with outlines with this nature can block the view of the lines. The upper blade of the right-handed scissor will hide the lines. To get rid of that you will need to cut in an anticlockwise pattern. In this way, you can cut a piece of paper or fabric with a right-handed scissor with your left hand. 1. Why does right-hand scissors cut poorly with a left hand? The cause is our right-hand functions differently. That’s why a right-handed scissor works best in a right hand. When it is used with a left hand the pressure is not utilized properly. 2. Can you use left-handed scissors with a right hand? With a little practice, you can cut things with left-handed scissors while being a right-handed person. But you might not cut with ease, effectively or efficiently. 3. Is it okay for a left-handed person to use right-hand scissor for a long time? It is not actually a good idea to do so unless you are used to it from the beginning. If you start using right-handed scissors suddenly for a long time there is a high probability that you will end up with a sore hand, finger fatigue or muscle soreness. 4. How to tell difference between a left-handed and right-handed scissors? The easiest answer to this is that a true left-handed scissor will look like a mirror image of a right-handed scissors. Left-handed scissors are very hard to find. As a very small proportion of the population of this world is a lefty. So it very unlikely that you will find a pair of left-handed scissors in your local stores. 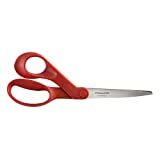 To get your best left-handed scissors you will have to order them online. But before you buy gain a proper inquiry about the products, that whether it meets your requirements.